shift7 has scouted potential partners and made network connections to advance renewable energy development, environmental health, and related entrepreneurship and arts. Youth engagement is central in much of this work. We have begun collaborating with Lakota Sioux and Navajo partners. Many Native American communities have unemployment rates that are among the highest in the country, and are working to build local economies that are self-sustaining, and not heavily dependent on extractive industries. Culturally cognizant, creative, patient business development support is needed to accelerate this transformation, with solution-making led by the communities themselves. shift7 has been identifying community-driven initiatives that foster both economic development and thriving ecologies, with models that could be scaled, shared, and locally adapted to accelerate the transition to sustainability nationally. Early engagements include workshops on energy such as the Oceti Sakowin Energy Summit, and partnering with MIT Solve on the launch of the Oceti Sakowin Fellowship. The 2018 MIT Solve Fellowship with the Oceti Sakowin supports outstanding members of the Oceti Sakowin community who bring renewable energy, food, and/or water projects to the community and contribute to economic prosperity and sovereignty. 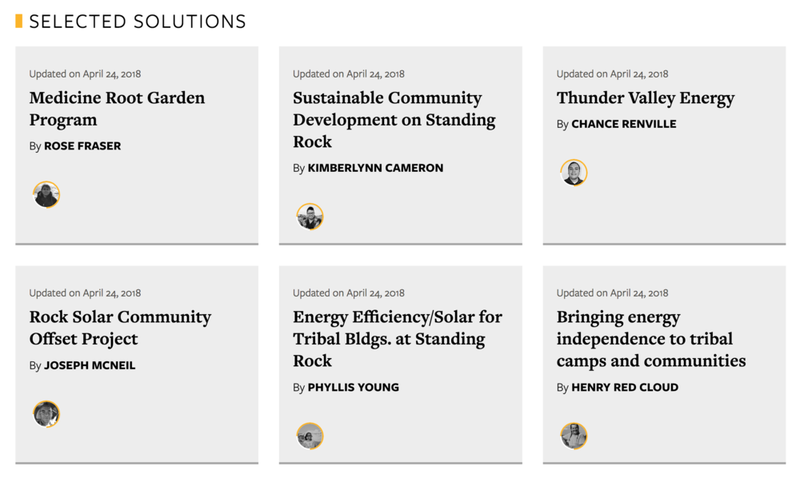 These six fellows will be supported to expand and accelerate their projects and their impact: Rose Fraser - Medicine Root Garden Program, Kimberlynn Cameron - Sustainable Community Development on Standing Rock, Chance Renville - Thunder Valley Energy, Joseph McNeil - Rock Solar Community Offset Project, Phyllis Young - Energy Efficiency / Solar for Tribal Buildings at Standing Rock, Henry Red Cloud - Bringing Energy Independence to Tribal Camps and Communities. shift7 has been in discussions with the Native American Business Incubator Network (NABIN) and other community-based entrepreneurship capacity-building and incubation partners to explore approaches for channeling resources (funding, mentors, partners and more) to support their work. NABIN provides support services to Native American entrepreneurs to help them create ecologically and culturally sustainable businesses, and builds community through connecting peers, mentors, and funders to entrepreneurs. shift7 facilitated sponsorship for NABIN to attend the Start-up Grind Global Conference in Silicon Valley. Recognizing that progress will also require expanding broadband connectivity in tribal communities, shift7 continues conversations with the team at Umoya and other solution-makers to focus on creative approaches such as Tribal International Carrier (TIC).